Earlier in 2018, HubSpot took major steps to tighten up their UI and provide a consistent interface throughout their stack. The result is a well done, high-end feel that you don’t mind working in day and day out. As you approach HubSpot one concept that you must subscribe to is that fundamentally HubSpot is an inbound marketing tool. As an inbound tool, HubSpot positions each tool to receive and collect prospect email addresses via forms, landing pages, CTA’s, and Ads. I mention this because you will find that there are alternative and singularly focused tools that provide more flexibility in exchange for a smaller scope of functionality. Before we go any further, HubSpot has chosen to keep their naming conventions rather generic. This lends to some of the confusion when trying to figure out which tool to use, but it also keeps categorization of activities and functions meaningful. I’ll do what I can to clarify between a service and generic terminology when I can without being overly redundant. Personalization is available system wide by way of property based tokens, allowing emails to be personalized with any property known within your contact or company database. Custom properties can be created for any in-house segmentation that you may desire to leverage for your efforts. HubSpot builds optimization recommendations into each of the email tools. Presentation of the optimization tool varies based on whether you are in the Design Tools or the more generic template editor. Optimization offers recommendations in list format for your subject line, low spam score, number of words, number of links, number of call-to-actions (in this case HubSpot generated CTA’s), and deliverability in addition to a few other HubSpot feature specific checks. Each of the primary email tools gets its own reporting tool with varying degrees of reporting information available, which can be a bit frustrating. Dashboards are the primary reporting tool and present the the core KPI’s such as opens, clicks, replies, click rate, reply rate. For templates and sequences you won’t find many reporting details beyond the basics. The ‘Email’ reporting tool is the star of the bunch and provides the granular detail that you would expect to find in any professional email management system. HubSpot Email is the primary email management and design tool used for scheduling emails to contacts and segmented lists that you’ve captured or imported. Emails can be delivered to contacts, lists, or companies each using filters for segmentation. HubSpot Emails will also be used in Workflows. In the HubSpot navigation email is found under Marketing -> Email, as shown below. HubSpot Email features a complete design tool for creating responsive HTML formats or simple text formats with personalization using any of the properties from a contact or a company. The design tool is shared by the Blog and Landing Pages allowing the sharing of core design elements and assets to create and maintain consistent design across marketing assets. HubSpot has also created a template marketplace featuring free and paid templates for those times when you need something fresh or something to hack on for a new campaign. The design tool also integrates an A/B tool with options to send out two versions of your email to a sub-section of your list for a few hours, pick a winner, then send the winner out to the rest of your list. I mentioned earlier that the reporting tool for ‘Email’ is the star of the bunch. One of the reporting tools I really appreciate is the ‘Time spent viewing email.’ I find it useful for measuring engagement and gaining insight on where your email may have gone off the rails. 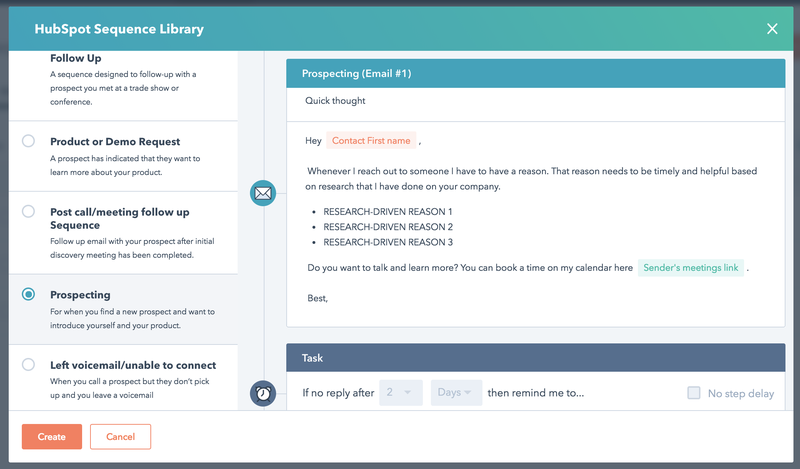 HubSpot Sales Templates are ‘pre-made emails that you can send to contacts and personalize, without having to type the same content each time.’ They are primarily used for repetitive emails that are good to have queued up to save time and maintain message consistency from your teams responsible for outgoing communications. In the HubSpot navigation email is found under Conversations -> Templates, as shown below. When you begin to compose a template you are presented with options to design ‘from scratch’ or ‘template library’. 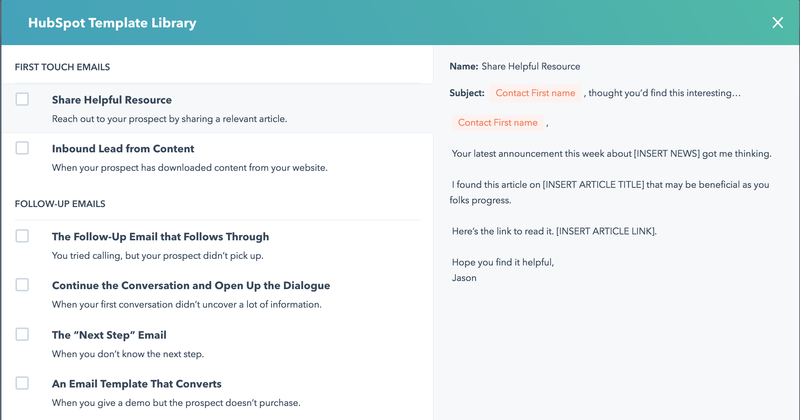 The template library provides a dozen or so emails to choose from based on funnel stage and intent with ‘First Touch Emails’ and ‘Follow-up Emails.’ Templates include subject lines, body copy, article links, document links, and meeting links guiding you to fill in the blanks with your value proposition, personal message, links et cetera. Reporting for templates isn’t nearly as robust as it’s Email counterpart. 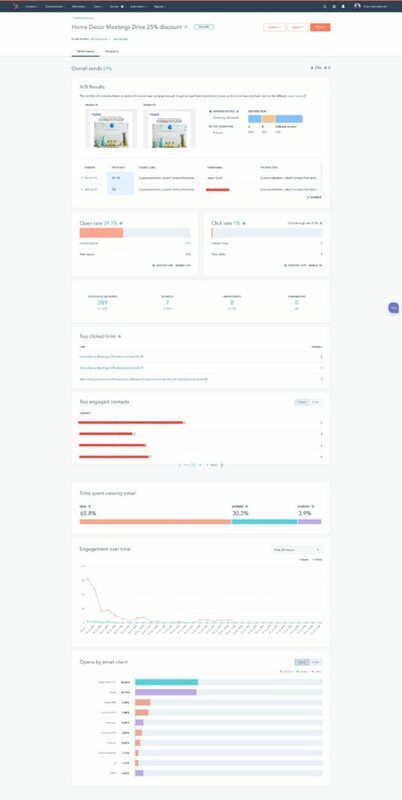 In order to see a performance report on templates head to Reports in the HubSpot navigation and add the templates widget to an existing dashboard or create a custom report. Once completed you will be presented with data on sends, opens, clicks, replies, click rates, and top users of templates that include the information broken out by individual sender. With the sequences tool you can send an automated series of timed emails, which is the foundation of any nurturing or drip email campaign. The Sequence tool also allows for the use of tasks, which can be used to remind the sequence owner to take an action based on user engagement or actions. For example, if you included a link to a catalog, you can set a reminder to check whether they downloaded the catalog and if they opened it, give them a call. The tasks do not have any affect on the campaign’s progression, they simply remind you to check on the assigned task. Sequences do not feature triggers, the phases are limited to enroll, complete, or unenroll. In the HubSpot navigation Sequences are found under Automation -> Sequences, as shown below. The provided templates will again provide subject line, body, and ’insert here’ prompts for your links and assets. There are options for tasks and delays, that can be modified based on your particular needs and customer insights. If you select to build a sequence from scratch the system will make any Email Templates that you have composed available to drag and drop into your new sequence. The assumption here is that you have thought through your campaign’s progression to arrive at your desired goal. If you are missing a step there is an option to ‘create template’ from within the Sequence interface. Reporting for Sequences is available from its primary landing page and can be inserted in a dashboard as a widget. On the landing page report, data is limited to total enrolled, reply rate, and meeting rate. The dashboard widget offers un-enrolled rate, completion rate, and error rate as additional reporting data. Workflows are similar conceptually to Sequences, but allow for triggers, mapped actions and branching logic. They are useful for nurturing your leads through your marketing lead funnel and qualifying them at key steps based on their actions and responses. In the HubSpot navigation Workflows are found under Automation -> Workflows. Workflows require considerable preparation of materials to be used effectively. HubSpot Emails (the main email tool with designer tools) for Workflows have to be saved for automation to be used. If an email isn’t explicitly saved for automation, then it will not appear as a choice for an action. 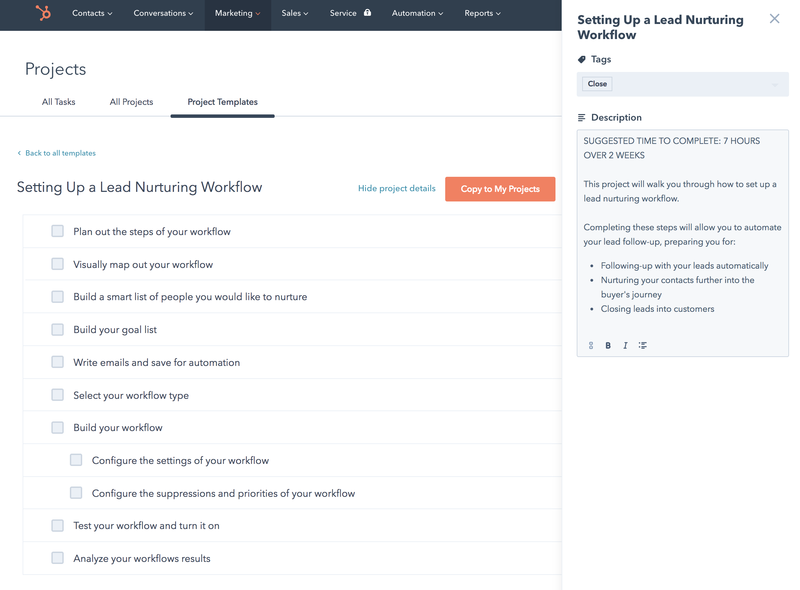 I highly recommend reading ‘How to setup a workflow in HubSpot’ and using one of their project templates to assemble your first workflow. This allows you to respond to one of my articles from your own site. To use a webmention, your published response should contain the URL of this article, anywhere in the body of your post. Your response will then appear (possibly after moderation) on this page.